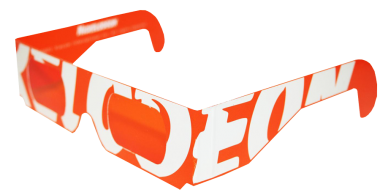 Unlimited lens colors, full color printing, and intricate die cutting capabilities make it easy to create your own paper 3D glasses with lenses to fit any occasion. How about pink lenses in a flower-shaped frame for looking at a rose-colored world? Sound like fun? You can design the 3D custom glasses as well as the lenses to go in them, and we will build them. Call for a free estimate on 3D specialized lenses today! Need ideas? See below for a few examples of the thousands of specialized lenses that we have developed for our clients.